Our Knutsford showroom has one of the largest displays of Ted Todd engineered floors in the region. And that just got bigger as we recently welcomed lots of new additions, including some from the Woodworks by Ted Todd collection. There’s now even more textures, colours and choice of expertly crafted engineered wood floors to choose from. Find out more about some of our favourites! 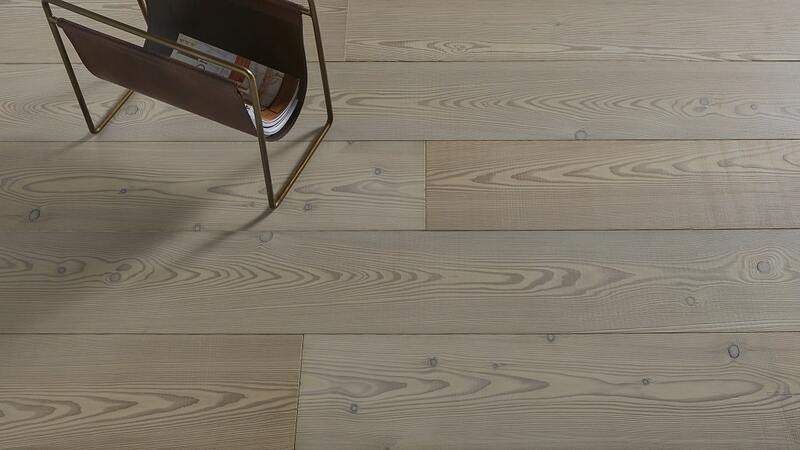 As the name suggests, the engineered wood planks in the Crafted Textures collection all feel as good as they look. That’s because a mixture of techniques has been used in their creation to give them a stunning textured finish without compromising on quality. Each plank offers something quite different, so it’s worth visiting our Knutsford showroom to touch them as much as see them for yourself. For pale planks with light tones, there’s the Arden plank with its coastal weathered texture. Or Coombe which is so beautifully light and finished with a hardwax oiled, shadow sawn texture. For a more traditional colour, the deep brown hues of the Wiston plank with its intricately patterned shadow sawn texture oozes the look of classic in any interior. Showing: The Wiston plank in the Crafted Textures collection from Ted Todd – see the sample at our Knutsford showroom. The Aged Woods collection from Ted Todd falls under their Woodworks umbrella. Woodworks by Ted Todd is a celebration of Ted Todd’s craft and passion for wood, where for over twenty-five years they have learnt all about old wood, bringing it back to life and revelling in the beauty of its heritage. Floors in the Woodworks collection are made from unusual or rare antique woods, reclaimed wood from Britain’s Industrial Age, and some of the highest quality new woods. The finest French oak from Quercy is used in all the floors in the Aged Woods collection. The Ted Todd craftsmen spend hours drawing out the character of the woods by hand, emphasising the flow of the grain and the undulating texture of the woods to leave a floor with an authentic, aged feel. The final finish is a floor of such elegance with rich oak tones, it transforms any space. 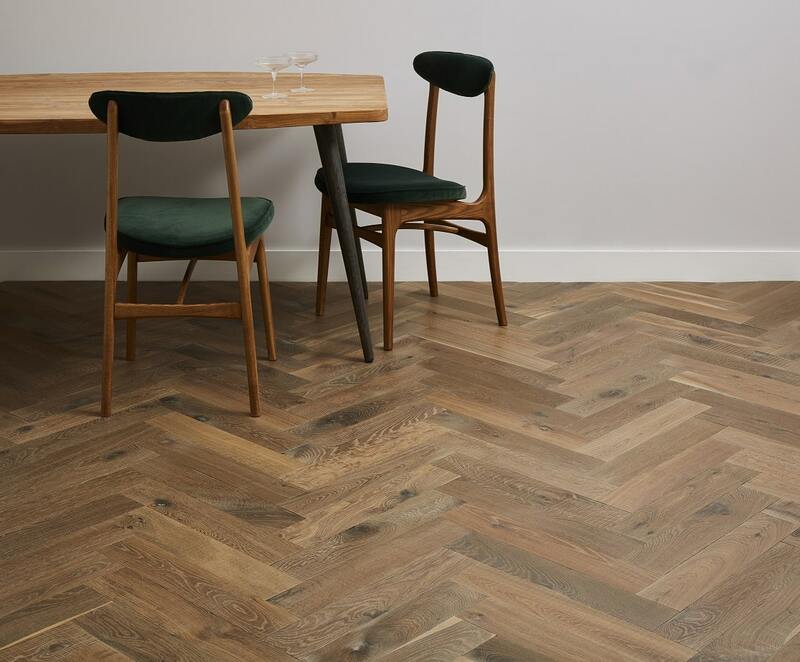 For a modern room and a floor with neutral tones, see the Lauzes oak floor – we love it in a chevron laying pattern. There’s also the Cambes plank with its white chalked finish; like the Lauzes design, it’s available in plank, herringbone and chevron formats. For a more traditional interior, the Quissac plank is perfect with its deeply aged, rich tones. Showing: Champagney Herringbone in the Aged Woods collection, from Woodworks by Ted Todd. If you’re looking for something that ticks both the classic and contemporary boxes, this is ideal. Champagney features a mix of washes and ageing processes to develop a unique wood floor. Each individual block is sanded by hand to create a soft surface that looks like it’s been worn by time. See and feel a sample at our Knutsford flooring showroom! Showing: The Rivelin plank in the Editions collection with its unfinished ‘raw’ look. Stunning bleached hues blend with colourful knots for a high-quality floor that will fit perfectly within any modern space. The planks are finished with a naked skin lacquer for that ‘raw’ finish as much as to keep the Rivelin plank looking fabulous for years to come. Authentic and timeless, each plank in the Bold Surfaces collection tells a story. More than just a floor, the woods capture a lifetime of history and heritage. Manufactured in the UK, they feature particular markings that not only give them their wonderful character, but make reference to their former uses, capturing the essence of their where they originated. 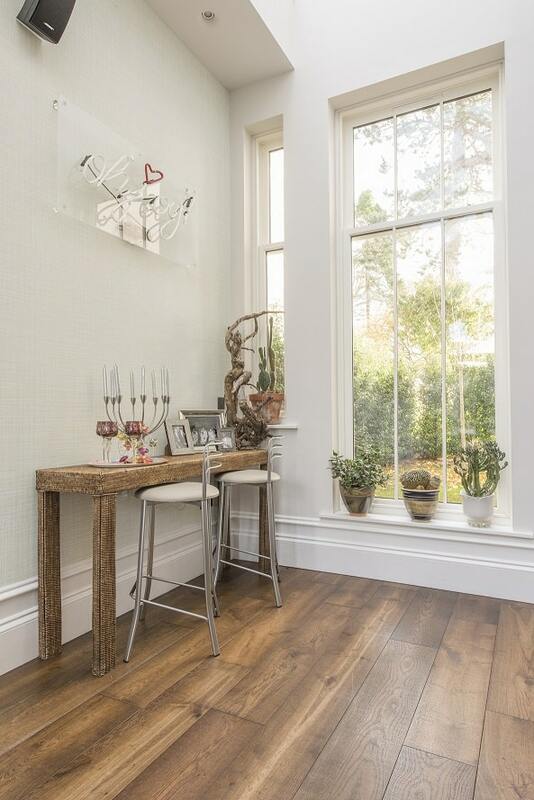 You will find the Heyday plank at our Knutsford showroom – an oak that was once used to build 19th century farm carts and now brings a raw, rustic look and feel to the floor. Bodega with its depth of colour makes a unique floor with its raw, original texture. The sunny oak of Bodega comes from the oak casks from which the wood was sourced. Hip is a 20mm solid wood floor made from reclaimed pine Victorian floorboards – the planks still show the blackened nail holes and wear and tear of many generations. A great addition to any home, wood floors in the Bold Surfaces collection can inspire storytelling as much as take centre stage as fabulous looking floors. Call in to our Knutsford showroom to see for yourself! If you are looking for an engineered hardwood floor for your home, our Knutsford showroom which is open Monday to Saturday, is the must-visit place. Here you can take a first look at many of the Ted Todd and Woodworks by Ted Todd floors to get inspiration for your project, before arranging a free estimate. Our engineered hardwood prices are very competitive and of course we can install the floors to the highest standard for you too. Call in to talk Ted Todd, see the woods and get the floor you love.